""" keywords'/> "" " How To Create A Huge Impression In 7 Seconds And Win Auditions | Best Actor Academy-The Monster Of Free Acting Tips ""
You Only Have 7 Seconds To Leave A Good First Impression. Here's How You Can Do It. There are 86,400 seconds in a day. More than 30 million seconds in a year. 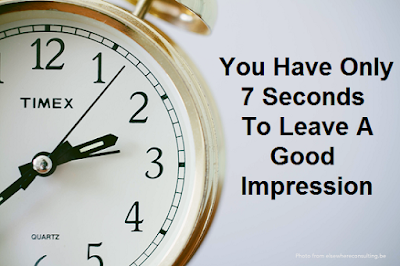 But it only takes 7 seconds to form a first impression. And these 7 seconds can change your coming years if not the entire life. 10 seconds to leave an impressive first impression on the casting director. Some people believe the first impression isn’t that important. People can eventually understand who we are actually capable of through interaction afterward. Has this been proved? No, but of course we hope we can. The science has revealed at least twice the effort is required to change the first impression. First impressions have a significant effect on the selection process and people involved in the casting of actors-casting directors, Film and TV directors and others with whom you will be in contact and would play a definite role in the success of your acting career. In a first impression, the person you are meeting is looking for answers to three basic things about you: "Do you fit into the character well? ", “Are you a better performing actor compared to others?”, "Do you trustworthy and easy to work?" Some people seem to have a natural charisma that leaves no doubt about these questions. For the rest of us, there are some simple steps to take that improve the chances of making a mark in any first social or business meeting. The key is that we want the others to feel good by our presence as if the way we want to be treated when we meet new friends. True. We should not judge a book by its cover. But who will bother picking up the book if its cover scares people off? In order for others to explore us further and deeper, we need to seek a way for them to be interested in us at the very first. Be like a book with rich content as well as an attractive cover. Before actually knowing you deeper through interaction, physical appearance is the first clue one relies on to interpret who we are. Besides, it is a way to show respect by choosing appropriate attire for different settings. It also means the person means something to us by dressing properly. If it is a formal setting, be aware of the dress code or culture. The requirement varies from culture to culture. A thumbs-up here does not mean the same elsewhere. Do the research! Grooming and dressing are the keys here. Are you cleanly shaved? Is your hairstyle messy? Are the clothes neat and tidy? The neatness and tidiness from all these little areas affect much on the impression on the whole. Even if not 100% sure and it's your guess, behave and give answers confidently. As an actor, basically, the decision makers are interested in your performance and not in right or wrong. Don’t rush your answer. Think thoroughly before any words come out of our mouth. Rapid answering gives an impression of insecurity and anxiety. Yet, don’t stay too long to answer or you appear hesitant. Maintaining a moderate amount of eye contact delivers a sense of intimacy to the one we interact with. Consequently, they feel more connected to us and tend to be more positive toward the interaction and our content. What makes a quality eye contact? Well, try to identify the color of the others’ irises (in the center small color circle). Get it? That makes a good eye contact example. Attractive. Competent. Trustworthy. Sincere. Confident. Are these the impression we want to leave? Stop staring at the ground and look at people in the eye then! The tempo matters too. Never speak too fast. It’s difficult to capture the gist in a machine-gun style of flow. It is lethal to any interaction. It is deadly to our impression. Instead, talk with ease. Have a steady and calm flow. Properly segment our sentences to ensure the others can follow us and get the idea. Voice and tones play a role too. Moderate alternation of speaking tones avoids us sounding too dull and monotonous. A slightly raise or dip of tone can hint on the important part of the message. Raise of volume also works. In the end, we will find ourselves sounding more appealing than we can imagine. Remember conversation is a turn-taking action. We talk. They listen. They respond. We listen. It is simply nonsense to constantly talking, depriving others of their opportunities to speak. While listening, take notes of what the others are talking about. Attend to the others’ speaking by leaning slightly toward them. Look for something to praise the others. It can bring closer one another and connect with others more. Remember conversation is interactive. If we praise the others, they are more willing to praise us and BINGO! We get the desired remarks and impression. 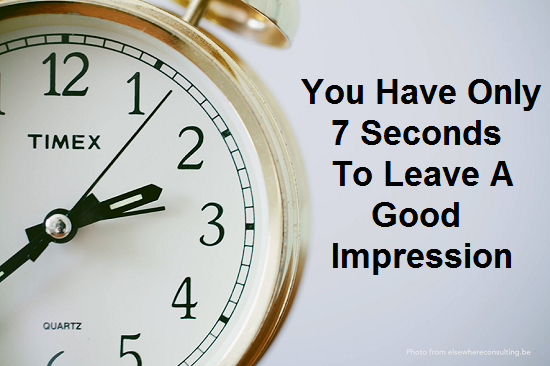 Remember that 7 seconds are enough to change your life!